MONTREAL – Montreal Canadiens general manager Marc Bergevin announced Friday that the team has agreed to terms on a two-year contract extension with forward Tomas Plekanec (2016-17 and 2017-18). Plekanec, 32, played all of the Canadiens’ five games thus far this season. He ranks tied for first on the team in goals (4); and tied for second in points (4) and differential (+7). The 5'11'' and 195 lbs forward served two penalty minutes and scored one winning goal. Plekanec has won 52.9% of his faceoffs (63 out of 119), while playing an average of 19:30 per game. Since making his NHL debut with the Canadiens in 2003-04, Plekanec ranks tied for 24th in team history for games played (766), 21st in points (503), 22nd in goals (206) and 26th in assists (297). Plekanec scored 49 goals on the powerplay, 18 while shorthanded and 32 winning tallies. He displays a career +47 differential and has served 440 penalty minutes. 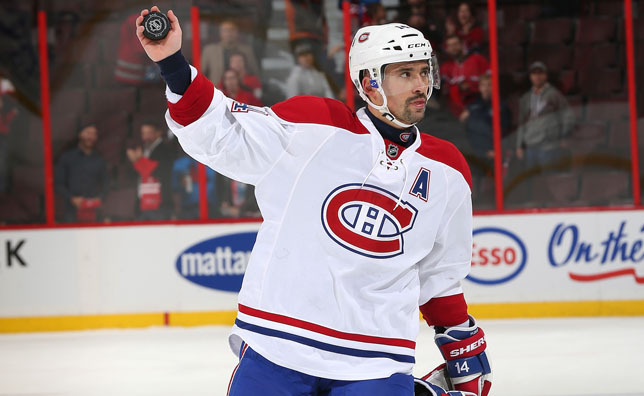 In 81 playoff contests, Plekanec collected 46 points (15 goals, 31 assists). On the international stage, Plekanec suited up for Czech Republic at the Winter Olympics in 2010 (Vancouver) and 2014 (Sochi); at the World Championships in 2006 (silver medal), 2007, 2008, 2009, 2011 (bronze medal), 2012 (bronze medal), 2013 and 2015; at the World Junior Championships in 2001 (gold medal) and 2002; and the 2000 World U18 Championship. A native of Kladno, Czech Republic, Plekanec was drafted by the Canadiens in the third round, 71st overall at the 2001 NHL Entry Draft.